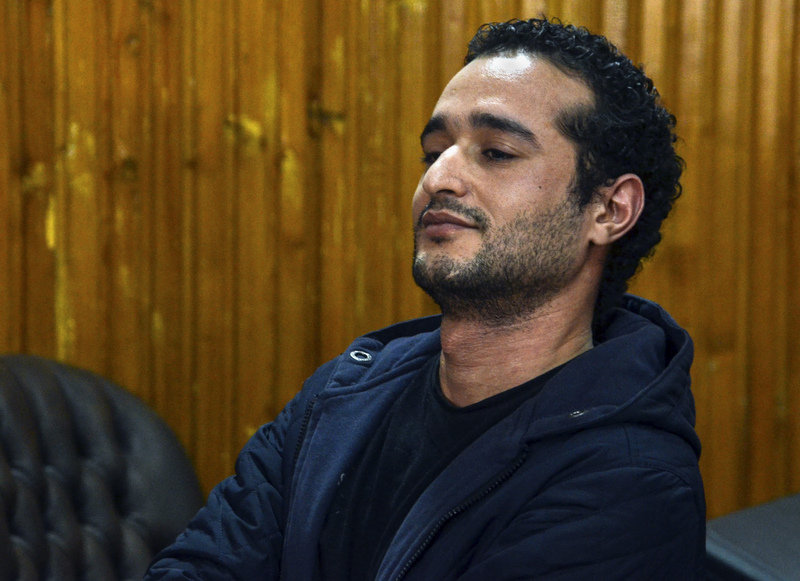 Every ruling party in Egypt since Hosni Mubarak’s National Democratic Party has at one time or another arrested 26-year-old Ahmed Douma, a law student at Tanta University and an activist and blogger. Douma rose to prominence during the 2011 uprising, but his political activism started much earlier and has followed an unlikely trajectory. Born in 1989 to a strongly Muslim Brotherhood-affiliated family, his father was a leading figure in the Beheira governorate. Douma became involved in activism at the age of 11, when he lobbied for Muslim Brotherhood candidates running for parliament and promoted the group’s activities. All that changed when he heard his father talking to other members of the Muslim Brotherhood about the Kefaya movement, a newly formed political opposition group, in 2004. “He travelled in secret to Cairo and took part in the first protest that Kefaya organized; that is when his conflict with the Muslim Brotherhood started to take root,” says Norhan Hefzy, Douma’s wife. Following the 6 April protest, which was the first to directly challenge Mubarak’s iron-fisted rule in many years, Douma left the Muslim Brotherhood when it refused to join the protest. He also left his hometown and moved to Cairo. He was one of the founders of the 6 April movement and became a member of Kefaya. On 4 February 2009 he was arrested at the Rafah border crossing into the Gaza Strip, having travelled there to express solidarity with the Palestinians during Israel’s war on the tiny territory. A week later, he was tried by a military tribunal and sentenced to one year in prison and a fine. He was allegedly tortured while being transported to prison. When calls began spreading online for a protest on 25 January 2011 – National Police Day and an Egyptian public holiday – Douma was among the first small group of young people to take to the streets. He was in Tahrir Square for the following 18 days, a period that ended with Mubarak stepping down and appointing the Supreme Council of the Armed Forces (SCAF) to lead the country. But that was not to be the last of his political activism. His first post-revolution arrest came when he joined a sit-in outside the Cabinet offices in Cairo to protest the appointment of Kamal Ganzouri as prime minister by SCAF. When the military violently dispersed the sit-in, he was arrested and charged with “inciting violence against the army and encouraging attacks on public property”. He was held for a month pending investigations. In a television interview during the clashes outside the Cabinet, which lasted nearly a week, Douma admitted to throwing Molotov cocktails at security officers in self-defence, after the officers opened fire on the protesters. In later interrogations, however, he denied that he had assaulted any military personnel during the dispersal. He was eventually released pending further investigations. During the presidential elections of 2012, which were the first free elections to be held in Egypt, Douma backed socialist candidate Hamdeen Sabahi. Sahabi lost the first round of the presidential race but formed the Egyptian Popular Current movement that later became a political party. During the second round, Douma joined Sabahi’s movement and opposed both the remaining contenders: Mubarak’s former Prime Minister Ahmed Shafik and the Muslim Brotherhood candidate Mohammed Morsi. “He started a small sit-in and refused to accept that that the revolution had to choose between two bad options. He said this choice would be the death of the revolution,” says Hefzy. He remained vocal in his opposition to the Muslim Brotherhood and Mohammed Morsi, who went on to become the first elected president after the uprising. When he called Morsi a “killer and a criminal” on television, he was arrested and sentenced to six months in prison for insulting the president. He was also accused of inciting violence against the Muslim Brotherhood and attempting to storm the movement’s headquarters. The ruling was overturned about a month later, following Morsi’s removal from office by the military in July 2013. Even though he had taken part in the 30 June protests that led to Morsi’s removal and was hailed as a hero for his anti-Muslim Brotherhood stance, the tides quickly turned again when Douma defied the restrictive protest law that was passed soon after Interim President Adly Mansour took office. In December 2013, after taking part in a protest that was illegal under the new law, Douma was arrested again with fellow activists Ahmed Maher and Muhammad Adel. They were each sentenced to three years in prison and fined the equivalent of $6,550. Popular sentiment in the streets of Cairo, which was highly supportive of the military and then Defence Minister Abdel Fattah al-Sisi, was strongly against Douma and other revolutionaries, who were often blamed for bringing the Muslim Brotherhood to power. Many people praised the sentence, but human rights groups and revolutionaries decried it and called on Mansour to issue pardons. “Ahmed joined so many movements and has taken a stance in many different campaigns. Overall, he’s been imprisoned 22 times,” says Hefzy. The young activist joined a hunger strike along with a number of others detained for challenging the protest law, in an effort to reverse their sentence and revoke the law, but he eventually had to end it due to his deteriorating health. While still in prison, Douma was retried for his role in the Cabinet sit-in in 2011. The judge presiding over the court sentenced him to life in prison and a fine of $2.25 million for setting fire to the Scientific Institute, an academy housing several rare manuscripts that were nearly destroyed during the clashes. On hearing the sentence Douma laughed and clapped sarcastically, angering the judge who threatened him with three more years for contempt of court. During his trial, Douma asked the panel of judges to recuse itself from the case on the grounds of impartiality, saying that it “does not hide its hatred of the 25 January revolution” of which he was part. The judge denied his request and insisted on proceeding with the case. Young liberals and revolutionaries saw the harsh sentences that Douma and others received – whether they were Islamists or liberals – as proof that the new regime was “settling a score with the 25 January revolution” and the figures that represented it. Douma has appealed the verdict but currently remains imprisoned, as he has been under four consecutive governments.